In the first leg of a BCIAA quarterfinal double-header Saturday afternoon, the No.2 seed Fleetwood Lady Tigers took on No.7 seed Governor Mifflin at Exeter Township High School. The game got off to a quick start for the 7th seeded Mustangs as they claimed a 7-2 lead at the midway point of the first quarter. However, the Lady Tigers, who finished the regular season at 19-2, would respond. Fleetwood would score the final 5 points of the first quarter to leave the game tied 7-7 at the conclusion of the first quarter. The Lady Tigers, led by Xiomara Toledo and Cyre Virgo, would go on to score 11 of the first 13 points in the second quarter. When the Lady Mustangs called timeout with 4:23 remaining in the second quarter, they trailed 22-13. When the two teams headed into the half, the Lady Tigers held a 24-13 lead. The two teams traded blows during the majority of the third quarter, before Fleetwood used a late 9-3 run to close out the frame. Cyre Virgo, despite playing a solid portion of the third quarter in foul trouble, was able to help the Tigers to a 39-22 lead after three. Heading into the final quarter trailing by 17, the Lady Mustangs used a strong press to claw their way back into the game. 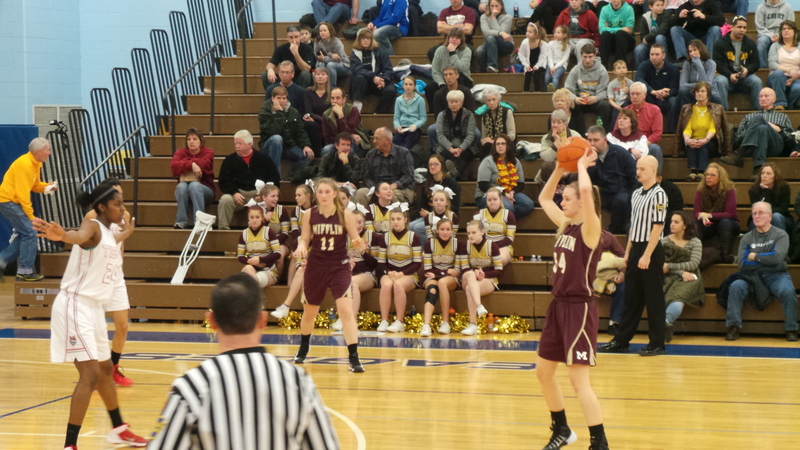 The Governor Mifflin girls controlled possession and did not let the heavily favored Lady Tigers get the ball across half-court for nearly two minutes. The Lady Mustangs, who were led by Jennifer and Melissa Martin, as well as Madison Koehler, were able to cut the Fleetwood lead down to as low as 8 points. However, with leading scorer Cyre Virgo fouled out, senior star Kendra Bamberger was able to will the Lady Tigers to a 54-43 victory. Leading the way for Fleetwood was junior forward Cyre Virgo, who posted a game-high 16 points and 11 rebounds. Senior Kendra Bamberger added 10 points and 13 boards, while junior Xiomara Toledo poured in 15 points of her own. The Lady Mustangs were led by Madison Koehler’s 13 points and 9 rebounds, while Kylie Herman and Melissa Martin each added 9 points. The Lady Tigers will face Oley Valley on Tuesday evening at the Santander Arena as part of the BCIAA semifinals.